Lady’s and Gentlemen… Let’s get ready to rumble! 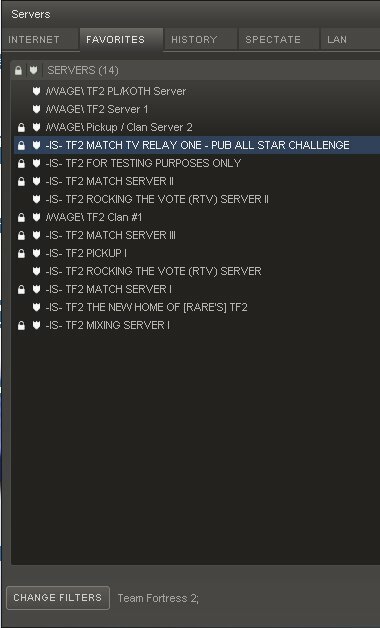 The TF2CSA Team are ready for action with the announcement of the “Pub All Star Challenge”. Pitting the recently crowned 6v6 champions, “WildGirls”, against a star studded Pubbers team, this match has all the ingredients for a classic. Do the PAS even know what role scout plays or how to rocket jump? Will they prove the competitive side wrong and demonstrate why the Pyro is not just a “w+M1” class? Can the PAS take down the reigning TF2CSA champions, Wildgirls? Make sure to watch this exciting encounter on 23 May! The Pub All Star team will consist of 9 players, captained by Likalota. Wildgirls will attempt to beat the Pub All Stars in a 9v6 challenge. One thing to note, the PAS are playing in Highlander format, one player per class. The match will be played on IS Match Server I and will include three maps. The match will be broadcast on IS Spec TV I. We’ve boosted the available viewing slots to 150, so make sure you come and watch! use the details below to connect to the Source TV channel. TF2SCA Class Restrictions. Wildgirls: Two of every class with only one Medic and Demo man. PAS: Highlander mode, only one of each class. nice idea…. although most of the Pub stars are actually previous clan stars and would make an awesome clan by themselves. So I dont actually think the game will be fair or balance but awesome idea and well done on coming up with all these things to push the community! So it’s kinda like the same thing that is done on steam forums all the time, except the pub team isn’t limited to just highlander classes? Could be interesting, apparently it turns out to be quite balanced despite being 6v9. Due to some, er…, well…, “suggestions” from the competitive side of the neighbourhood, we have decided to run the Pub All Stars team in Highlander mode. This follows the convention set in the European 6v9 competition. Now less talk and more gameplay… The PAS playing on highlander format will make it more realistic, fair and fun. If PAS wins, it’ll be because there’s 9 of them. If WG wins, it’ll be because they have class stacks. Utterly pointless if you ask me, as the “pubbers” are half compies as well. This challenge is more about “having fun” and “community interactivity” as we trying to close the gap from pubs to competitive gameplay and maybe this can be a way to introduce pubbers to play pickups and so on. Overseas was a hit and got lot of people exited about it and now there is a 3rd edition of it so I think is worth a try over here. Mediced Serp on pub the other night, trust me he still in shape!! Its all about the Fun guys. How did you play Deacan! LOL.. I played pretty much like usual… like a noob!! This should be an awesome game to spec. PAS has some potent players, wow. Also have to mention i also has some decent players. Going to be a close game. I shall be saving my cap to watch this! Anyone taking bets?..Coke at OC or something. how about a class roster for PAS? This is going to be epic. Good stuff guys. Was a little imba…. 9 v 6 some current clan players and some past clan players. Would of been interesting if the all star team was purely public players with no clan or pick up experience. However I can appreciate how difficult that would of been to achieve in South Africa. All in all we took it in the spirit that it was meant to be taken tried our best and had good fun doing so! Thanks for playing Deacon and all of WG as well as all the Pub Allstars. It is hard to pick players that are purely pubbers. The pub team had lots of pubbers, some of which have played TF2 competitively but a really long time ago. Scuba for example hasnt played competitively in about 1 year, neptune nine for about 2 years possibly. The only real competitive player i would say was Alien, who did mighty good. Thanks to Likalota for getting hold of 8 pubbers to make this happen, he has played in a clan recently, but was never serious. I seriously would have thought that 6 Current Competitive players would owned 9 Pubbers, 2/3 of them who have played in clans one year ago. We will have to wait for PAS Challenge #2 to see the Competitive side pwn. The Challenge was a success. I had 65 Specators at once stage. 40 of those are people that are not in clans = Success. Those who are in clans and were speccing, all commented on how they would like a shot vs the PAS. This was all in the spirit of fun. but we could really use shoutcasters with a little more life, and that give a bit more information. They did good with what they were given, but hopefully next time we will get more emotive, exciting shoutcasting.